For many heroes and villains, public interest waxes and wanes, and the Punisher is one anti-hero who has had plenty of ups and downs. 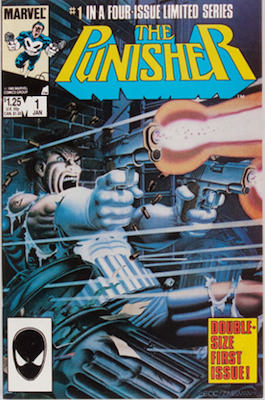 Hitting a peak in late 1980s to early 90s, Punisher comics have come and gone, but Frank Castle, the man behind the name, has always held a special place in the hearts of those who love his harsh vigilantism. 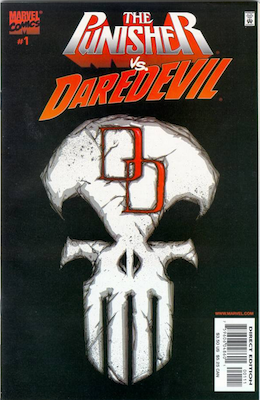 With Punisher appearing in Season 2 of Netflix’s Daredevil, interest in the character has sparked again. In May 2016, Punisher Volume 11 was launched, as well as a brand new Daredevil / Punisher series. Let’s take a look at the history of Punisher key issue comic books appearances, and find out how our friendly Frank Castle became so... frank. 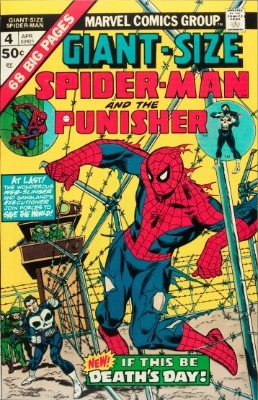 If you’re collecting Punisher comics, then Amazing Spider-Man #129 should be at the top of your wants list. 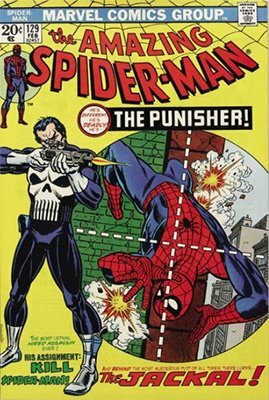 Punisher, created by writer Gerry Conway and artist John Romita, first appears as an extremely violent vigilante out to assassinate Spider-Man, who allegedly killed Norman Osborn. Decked out in black with his trademark giant skull (later used by SEAL Team 3 and American Sniper’s Chris Kyle), Punisher proves that he can hold his own against Spider-Man. Why is Punisher so damn angry, and where did he learn to fight like that? 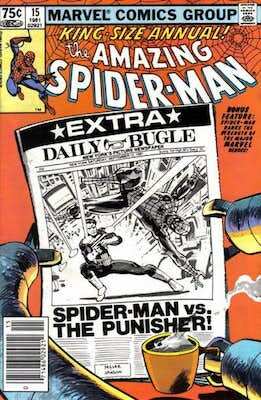 Amazing Spider-Man #129 doesn’t give up much about Frank Castle’s backstory, but his homicidal ways struck a chord with mature comic readers, and it wasn’t long before Punisher was popping up all over the Marvel Universe. Turning up again for his second full appearance in Amazing Spider-Man #135 (with a cameo in #134), Spidey and Punisher are slowly pushing their differences aside. That all unravels when Spider-Man finds himself in the middle of a fight between Punisher and Tarantula. 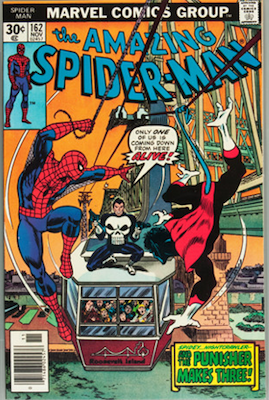 Second appearances aren’t always coveted by the casual fan, but for the diehard Punisher comics collector, Amazing Spider-Man #135 is an affordable investment. 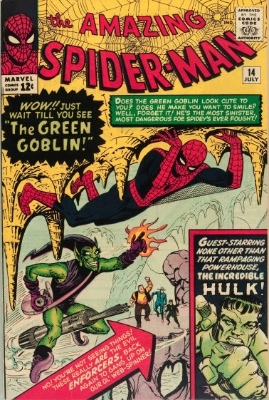 Note that this issue (along with other Marvel Bronze Age comics, like Incredible Hulk #181) was published with a Marvel Value Stamp. This is often cut or torn out from the inner pages. Check before you buy (or sell!) a copy. NOTE: The record sale was for a CGC 9.9. A typical 9.8 sale is $380-500. 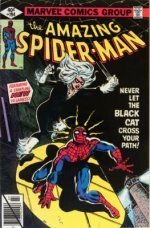 Launched in 1974, the six issue Giant Size Spider-Man wasn’t a big hit except for issue #4. 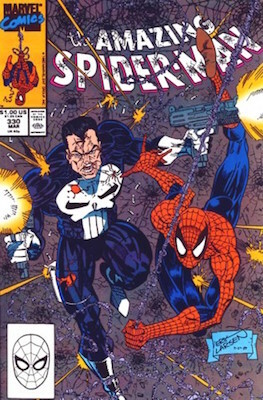 Featuring Punisher’s third appearance, Punisher and Spidey finally seem to be getting along, battling side by side against Moses Magnum (first appearance). Giant Size Spider-Man #4 is the most valuable issue in the series. Making his first appearance outside of Spider-Man, Punisher’s devastating origin story is revealed in Marvel Preview #2. A former U.S. Marine (with three tours of duty in Vietnam), Frank Castle’s wife and children are killed after they witness some mafia activity. 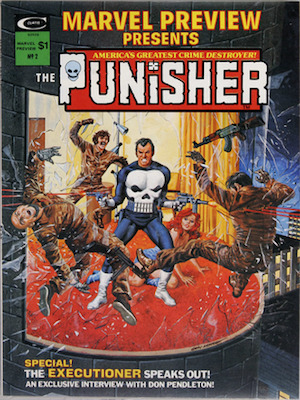 Now, completely unhinged with nothing to lose, Frank becomes the Punisher, a one-man war on crime. As an essential Punisher comic with his important origin story, Marvel Preview #2 is surprisingly common in higher grade. The Curtis magazines have tended to survive in better condition than you'd expect. Since Jigsaw’s first appearance in Amazing Spider-Man #162, he’s been Punisher’s archenemy and an antagonist in almost every Punisher comic series. 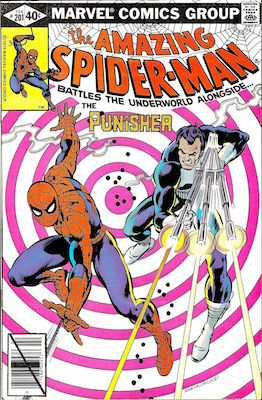 Amazing Spider-Man #162 is also notable for the first (and only) team up of Nightcrawler and Punisher. Because of the rare Nightcrawler / Punisher partnership and Jigsaw’s first appearance, Amazing Spider-Man #162 is a great investment if you’re collecting Punisher comics. 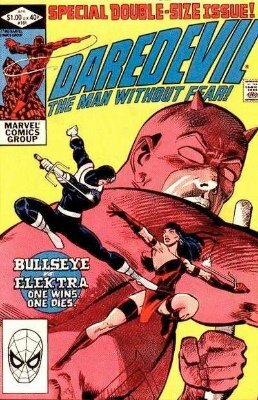 Taking the series in a whole new direction and reviving a once "second-rate" hero, Frank Miller’s work on Daredevil Marvel Comics is considered some of the best in comic book history. 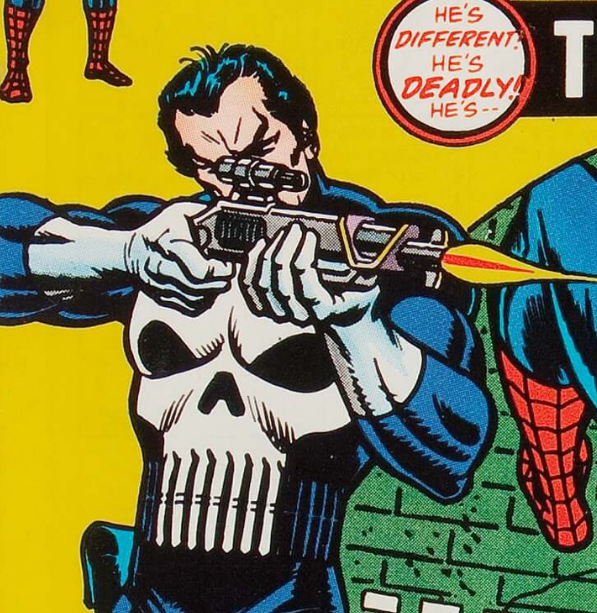 Until Daredevil, Punisher was nearly exclusive to Amazing Spider-Man. 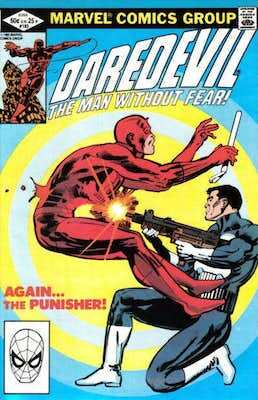 Starting with Daredevil #181, Punisher and Daredevil are brought together in a very memorable partnership (and we use the term "partnership" loosely). 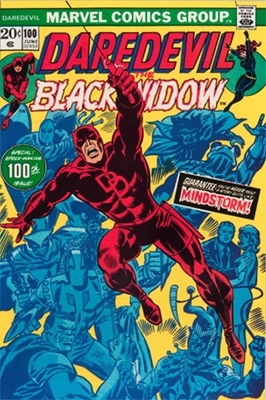 From Daredevil #181 to #184, we see Punisher escape jail (arrested in Amazing Spider-Man Annual #15), attempting to hunt down Bullseye, Kingpin, and other drug dealers, and of course, going against the grain of Daredevil’s tidy crime fighting. The Marvel execs weren’t sure that an ongoing Punisher solo series was a good idea, so they compromised: a five issue mini-series. Back in prison, Punisher learns of Trust, an organization dedicated to eradicating crime bosses. Looking like the perfect candidate for Trust, Punisher is released from jail to start crossing off criminals from his long list. 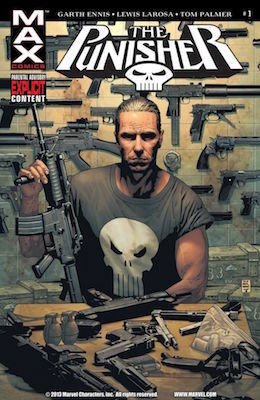 Because the Punisher mini-series was so popular, Marvel had no choice but to greenlight a full scale Punisher solo series. 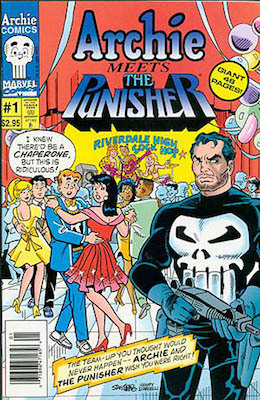 Running for 104 issues until 1995, Punisher (vol. 2) expands Frank Castle’s horizons as he takes on international cartels, terrorists, Kingpin, and his nemesis Jigsaw. 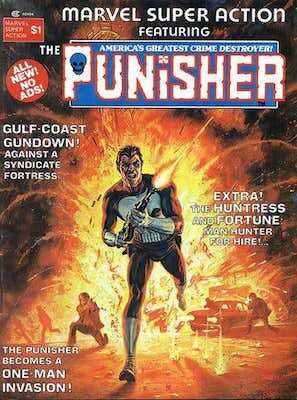 The 1987 Punisher series served as the flagship for other Punisher comics like War Journals, War Zone, and Armory. NOTE: The record sale was for a CGC 9.9. A typical 9.8 sale is $80-120. 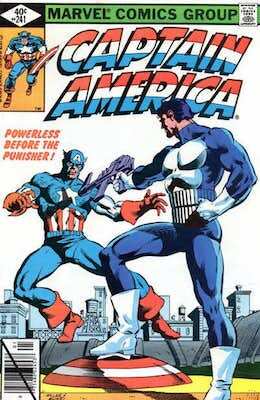 At the height of Punisher comics, one comic just wasn’t enough to contain Frank Castle and all of his fury. Launched a year after Punisher (vol. 2), Punisher: War Journal dives into Punisher’s past and includes several appearances and cameos from Marvel’s most popular heroes in villains. Some of the notable guests in Punisher: War Journal include Wolverine, Doctor Doom, Ghost Rider, and Spider-Man. 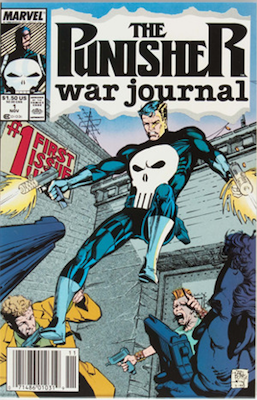 Punisher: War Journal ran for 80 issues, ending in 1995. War Journal Volume 2 was launched in 2006. Don’t get the rare Punisher vs. Daredevil confused with the common 2006 mini-series Daredevil vs. Punisher. Punisher vs. 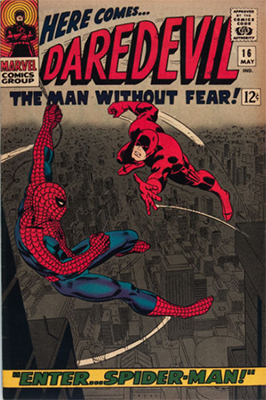 Daredevil reprints Daredevil #183, #184, and #257 - three of the greatest Punisher / Daredevil stories ever written. 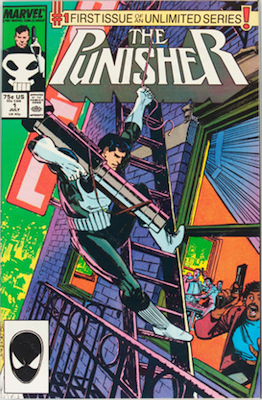 Part of Punisher’s appeal is that he never quite fit in with the rest of Marvel’s superheroes. 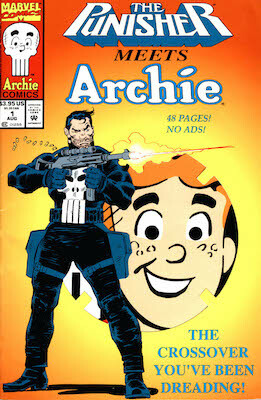 In 2004, with the rules of the Comic Code Authority abandoned, Marvel found a new place for Punisher. Punisher (vol. 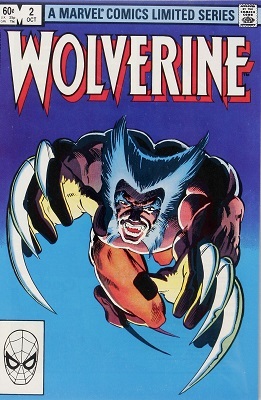 7) was launched under Marvel’s MAX imprint, which allowed for grittier, more realistic and violent stories. Exploring an aged Frank Castel’s Vietnam roots, his past demons, and the continued fight against drugs and crime, Punisher MAX was very well received and ran for 75 issues. NOTE: The record sale was for a CGC 10.0. A typical 9.8 sale is $40-60. 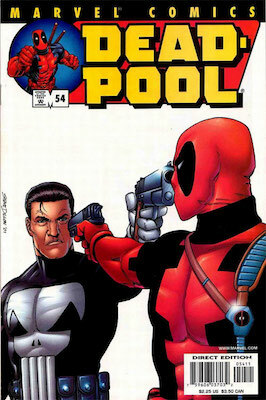 It would seem that Deadpool and Punisher could be best friends, but not when they’re trying to kill each other! When the Gnucci family hires Deadpool to kill Punisher, the Merc with a Mouth finds that it’s much easier said than done. Like many Deadpool comics, Deadpool #54 is a Modern Age classic and is becoming highly valuable. If you have any of the above issues, click here to have them appraised by Sell My Comic Books. Find out the value of Spider-Man, Daredevil, Iron Man and many more. 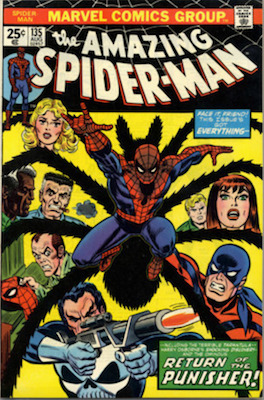 Find out the values of all the issues from ASM #1 through #129, and later key issues. Matt Murdoch now stars in a Netflix series. Find out the value of the comic books here. See the top 60 most valuable comics from the 1980s. Some surprises here! 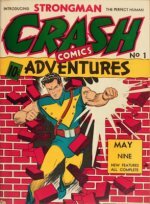 Sell Comic Books for immediate cash at Sell My Comic Books!